Autumn has arrived in the northeast and as daytime temperatures decline there are still a variety of fall blooms that can brighten and add longevity to your landscape. 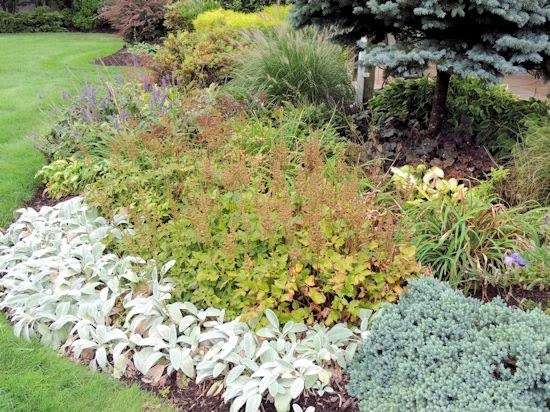 As many of the summer blooms start to fade fall blooming perennials and shrubs such as Sedum, Aster, Liriope, Goldenrod, Butterfly Bush and dwarf grasses among others can add interest to your late summer-fall garden and bring you enjoyment late into the planting season. 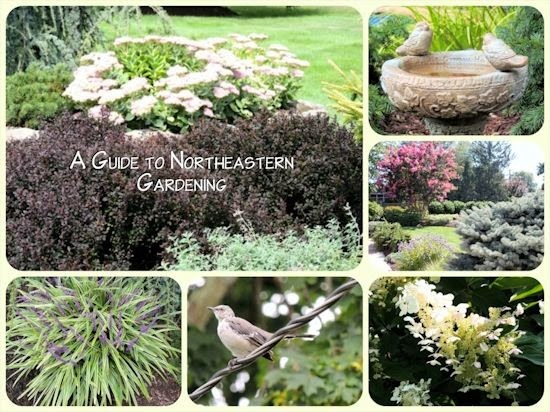 The varieties of shrubs and perennials mentioned below have proven to be hardy and reliable in my zone 7 northeastern garden and will be sure to add delight to your outdoor space. 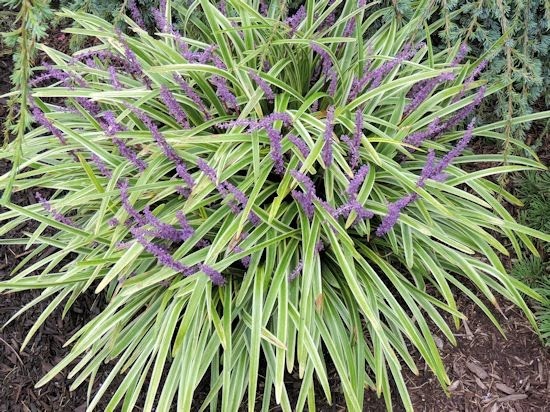 Height 8-16", Width 8-12 "
Variegated Liriope or Lillyturf is a wonderful perennial for all summer long with interesting texture and grass-like variegated foliage followed by vibrant eye-catching spikes of purple blooms in late summer and fall. It fits nicely into either a formal or informal landscape and lasts into winter. At this time of year it is at its peak and is spectacular! 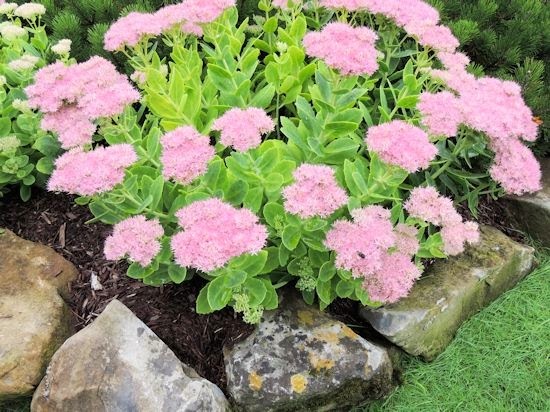 Height 18-24", Width 18-24 "
Sedum 'Brilliant' is a more compact form of sedum which stays upright while other varieties such as 'Autumn Joy' tend to get top heavy and fall over. 'Brilliant' displays vibrant deep pink blooms that turn orange in fall on top of succulent-like clumping foliage. Planted along with dwarf grasses it makes a nice fall statement. I have plenty of these on my own property and they always add wonderful interest to the fall garden. Asters are a known sign of autumn and are commonly seen in perennial borders or in container plantings. They add an eye-catching display of color to the garden. Asters come in a variety of colors including pink, purple, red, blue and white and serve nicely in a cut bouquet or as dried flowers. 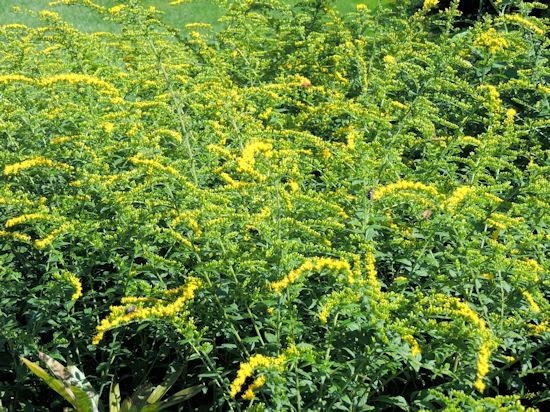 Goldenrod is a bright fall perennial that displays golden-yellow flowers on arching branches and is popular in the New England cottage garden. Do not confuse it with Ragweed which blooms about the same time and is an allergen to many! Goldenrod comes in a number of varieties ranging in size from two to six feet. 'Golden Fleece' (above) stays at a more compact height of only two feet. 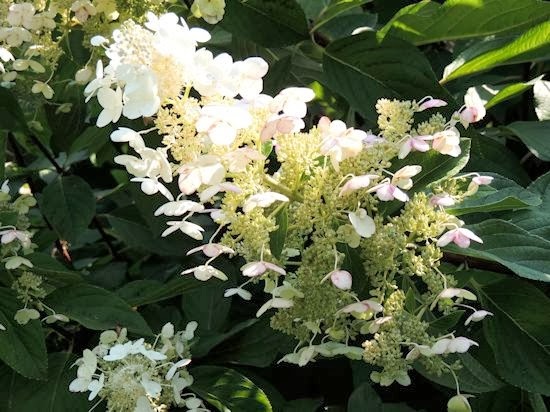 Hydrangea 'Tardivia' is a beautiful long blooming variety of hydrangea that lasts well into fall with large elongated white blooms on dark green foliage. While other varieties of hydrangea have completed their bloom season 'Tardivia' steps up to the plate and lasts well into the first frost. The gently fragrant blooms are an added wonderful delight as one passes by. 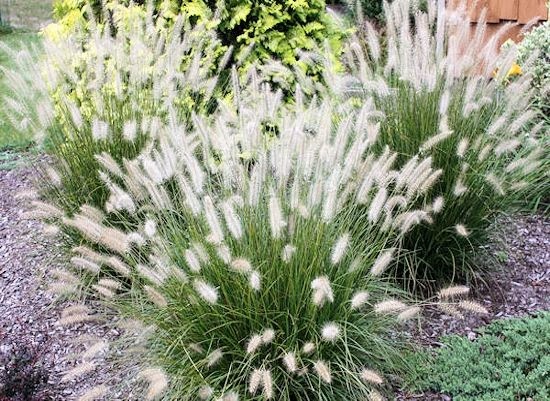 Dwarf fountain grasses are a popular addition to the garden due to their wispy silvery bottle brush plumes produced in fall. 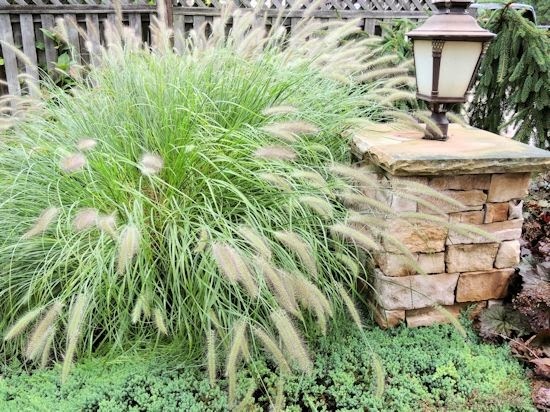 Fountain grasses add interest and movement in the garden throughout the season and provide winter interest as well. The variety pictured above is 'Hameln' which stays as a compact 2-3 foot plant and serves well in just about any type of garden. 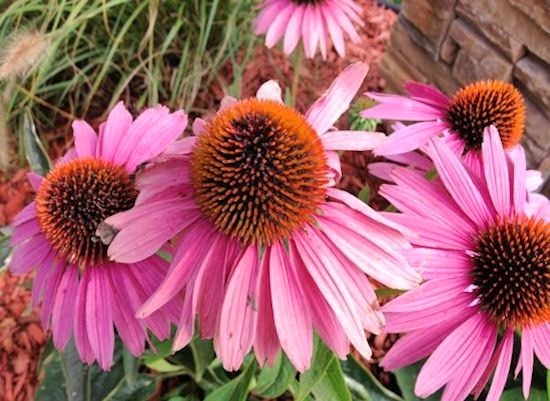 Echinacea or Coneflower forms showy upright clumps of vibrant blooms from late summer into fall that are a feeding station to many species of butterfly. 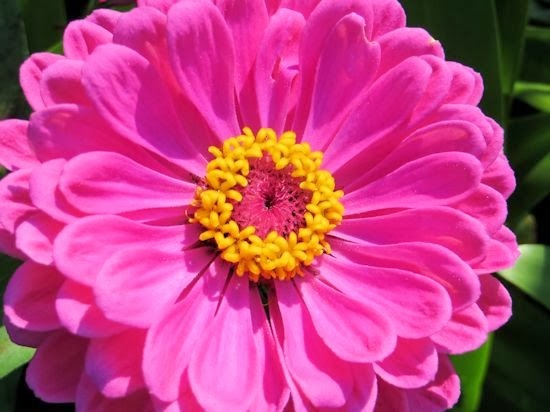 There are many varieties of this beautiful perennial ranging from pink to yellow to white and they serve beautifully in a perennial border, cottage or prairie garden. Rudbeckia or "Black Eyed Susan" is a popular perennial in cottage, woodland and prairie gardens and blooms from late summer throughout fall into the first frost. Bright golden-yellow petals surround a darker central portion that pop in the garden. Rudbeckia spreads freely and serves nicely as a mass planting in sun or part shade. Rudbeckia and Echinacea complement one another beautifully. Knock Out Roses are an excellent addition to the garden since they produce continuous blooms from summer throughout fall. 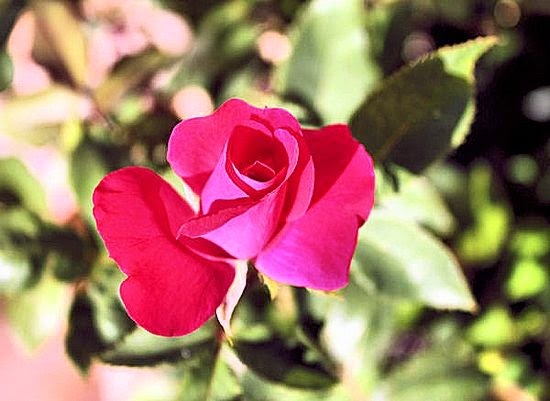 The above variety 'Radrazz' puts on a show of vibrant pinkish-red fragrant blooms all the way until frost and is a favorite of garden enthusiasts. This one is also a personal favorite of mine right along with Pink and Red Double Knock Outs. 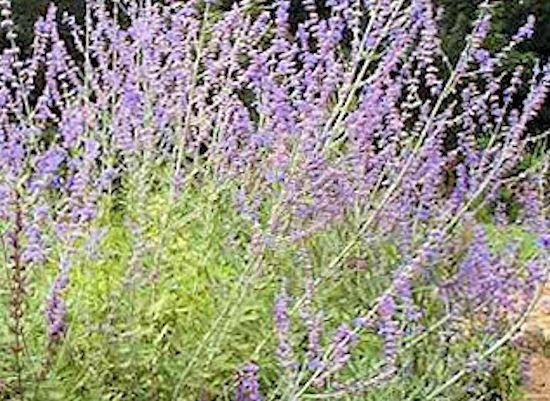 Russian sage produces bushy upright stalks of grayish leaves that are lacy and fragrant. Spikes of violet-blue blooms appear in late summer and last well into fall. The open informal habit of Perovskia makes it a great filler in the backdrop of a cottage style perennial garden or border. I recently discovered Chelone (Turtlehead) in a friend's garden this fall. 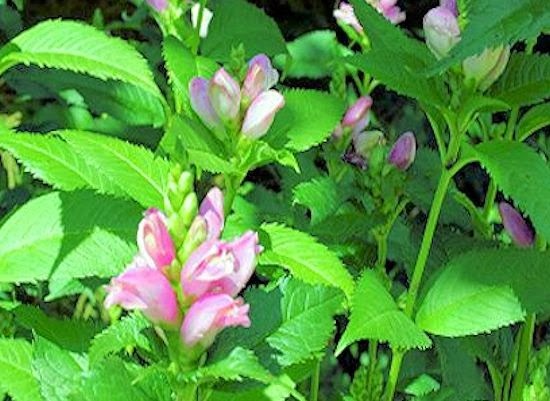 Turtlehead are native wildflowers that adapt easily to garden conditions. Showy and long-lived they are a magnet to bumblebees and butterflies and bring nature to the garden. They serve nicely in an informal perennial border. 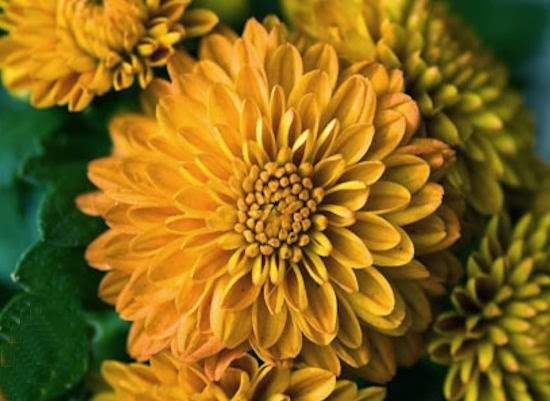 Last but not least is the traditional fall flower..the hardy Garden Mum. Mums come in a vast variety of colors and last well into the first frost. 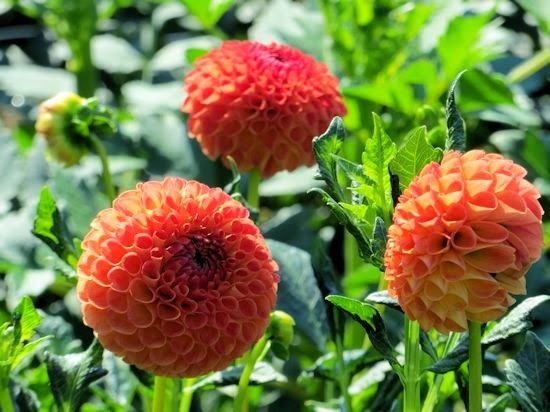 They are often planted in containers for a fall punch of color or can be placed in the garden for autumn blooms. The arrival of Autumn does not mean the end of the gardening season. 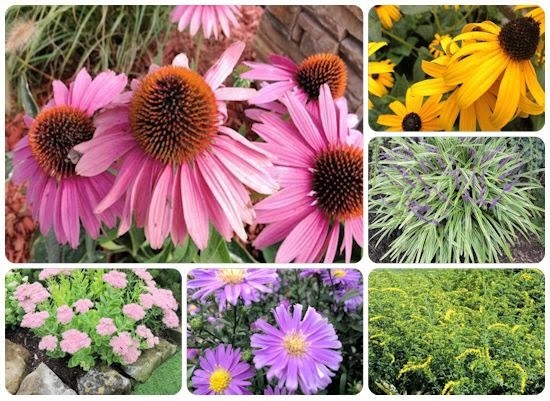 By simply adding one or more of these selections to your landscape your garden blooms will be prolonged well into fall and bring extended enjoyment to your outdoor space. The perennial garden on the west side of the patio is showing dried spikes of astilbe against the white fuzzy foliage of the Lamb's Ear and bright blues of the Juniperus 'Blue Star'. A hint of remaining purple pokes through from the Salvia 'Maynight' and plumes from the fountain grass can be seen in the backdrop. 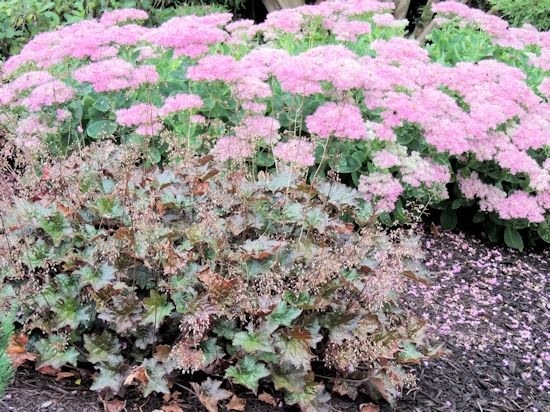 As the summer season comes to an end the gardens are showing signs of fall with bright pink blooms of sedum and plumes of dwarf fountain grass swaying in the breeze. The temperatures are now stabilizing in the 70's and in the evenings there is a nip in the air. It is time for look into the garden for another Garden Blogger's Bloom Day. 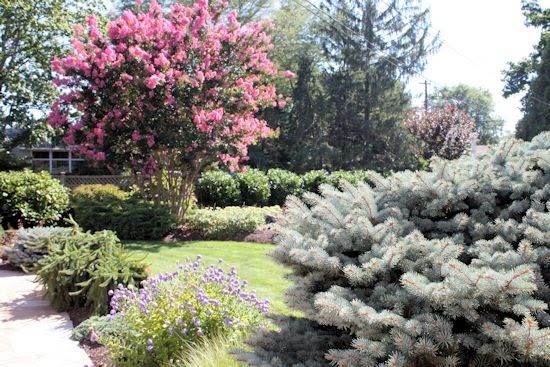 Come take a walk with me and let's see what is blooming in my Long Island garden. and Sedum 'Brilliant' is at its height with bright deep pink blooms. Along the back fence the hydrangeas are now at the end of their bloom and the flower heads are a lovely shade of pink getting ready for fall. One of my new favorites in the garden is Dwarf Butterfly Bush Lo & Behold 'Blue Chip'. 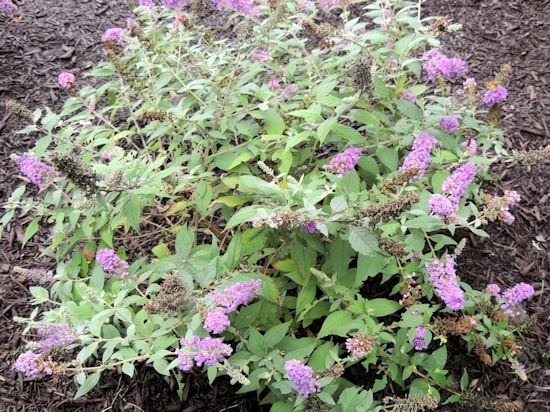 I purchased this variety of butterfly bush two years ago and recently planted three more in the front yard. They bloom profusely throughout August and September and draw an array of butterflies to their fragrant purple blooms...definitely one of the highlights of the September garden. Another favorite is Crape Myrtle. This one viewed from the back patio is still in full bloom after three months. In the foreground is Platycodon (Balloon Flower) which is also still in bloom at this time of year. Even though spring and summer are my favorite months, I look forward to these two blooms as the cooler temperatures approach. In the backyard these two plants, Sedum and Heuchera thrive next to one another even though they are known to grow in different conditions. The area gets just the right combination of sun and water for each and the burgundy and pink complement one another. 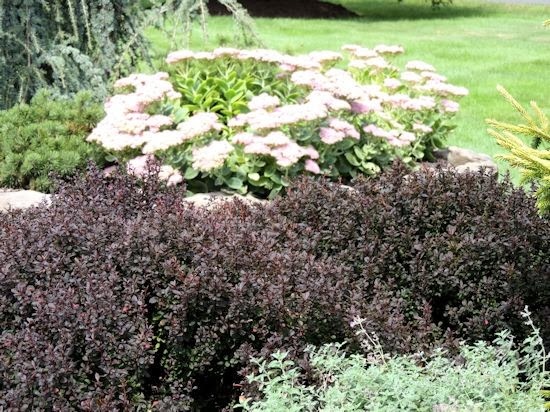 Another interesting combination is Barberry with Sedum, which you will see a few pictures down. 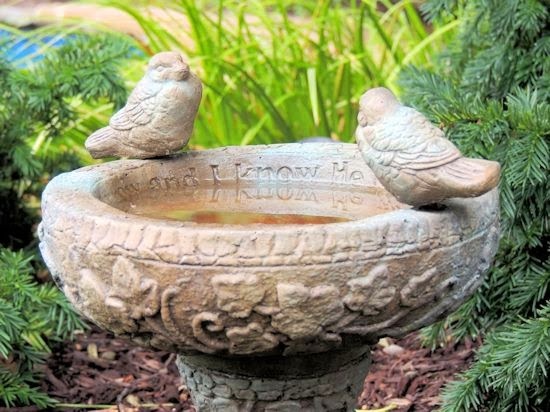 For a little bit of garden whimsy I recently purchased this bird bath from a local nursery out east and I love how the two little birds sit nestled on the edge. 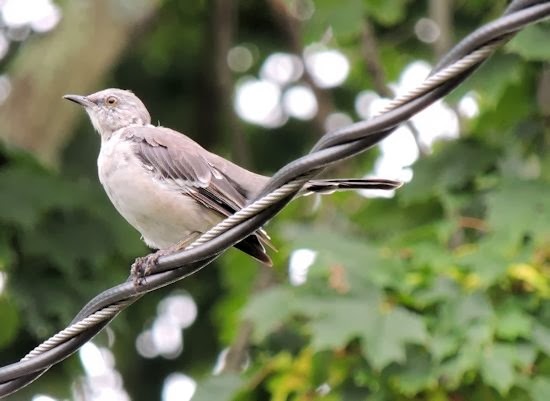 The local birds are enjoying the new addition as well each time they visit the garden. and here is Garden Gal. The Palace Purple Coral Bells are very large this time of year so Garden Gal is peeking out from among them playing a game of peek a boo. 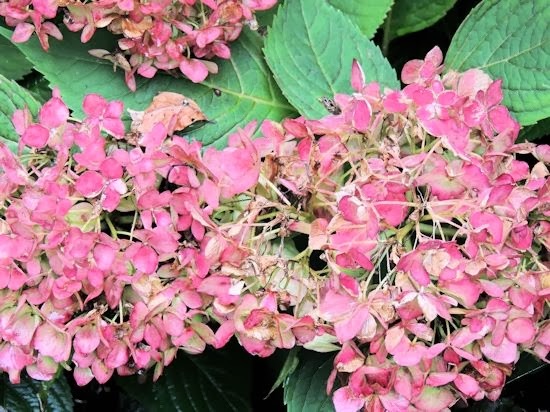 Hydrangea 'Tardivia' blooms later in the summer once the other hydrangea are through their bloom cycle. This one is located on the side of the house so it is fun to take a tour in my own yard to see the blooms. And last but not least is Daylily Stella D Oro. 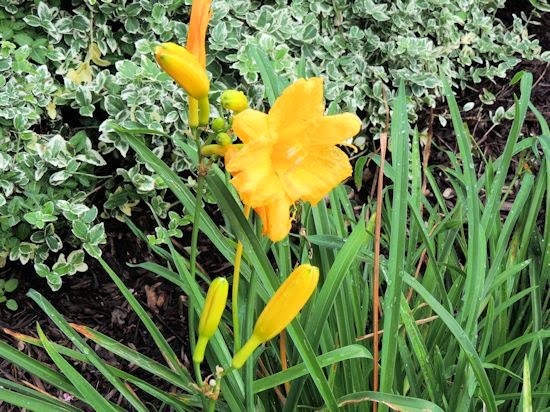 With regular deadheading this wonderful bright yellow daylily blooms throughout the entire summer and into fall and I can always rely on it to give me a burst of color. It is definitely a stable in the garden. Hope you enjoyed the tour and thank you for visiting my Long Island September garden. Be sure to also visit our Bloom Day hostess Carol at May Dreams Gardens to see what is blooming in other gardens around the world. 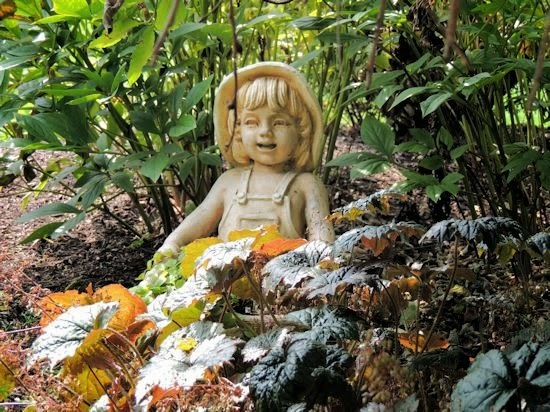 As summer comes to an end and fall approaches there is anticipation in the air as I look forward to the changing colors of the garden once more. 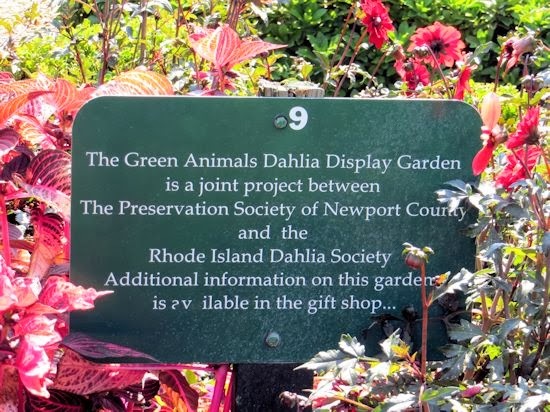 During a recent visit to Rhode Island I had the pleasure of visiting the Green Animals Topiary Garden in Portsmouth. This small country estate consisting of seven acres of land overlooks Narragansett Bay and was purchased by Thomas E. Brayton in 1872. Mr. Brayton was the treasurer for the Union Cotton Manufacturing Company in Fall River, Massachusetts from 1879 to 1920. 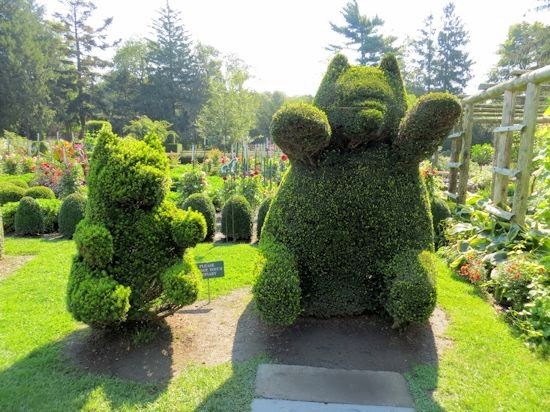 He hired Joseph Carreiro who was responsible for creating and maintaining the topiary garden. 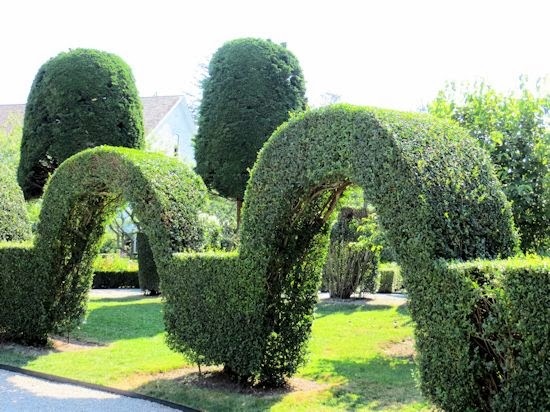 Carrero's son-in-law took over and continued to develop new topiary upon Mr. Carreiro's death in 1945. Upon Mr. Brayton's death in 1940 his daughter Alice inherited the estate and resided there until her death in 1972. Alice Brayton known for her love of horticulture named the estate after its unique sculptured green topiary. 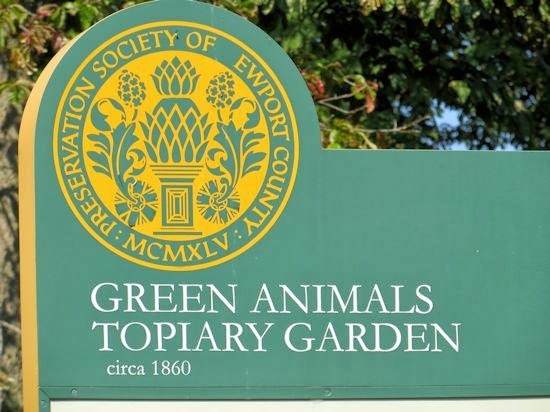 Green Animals Topiary Garden was left to the Preservation Society of Newport County and remains today under their care as a historic landmark. There are more that 80 pieces of topiary throughout the gardens and one of my favorites were these two teddy bears made of yew (Taxus). 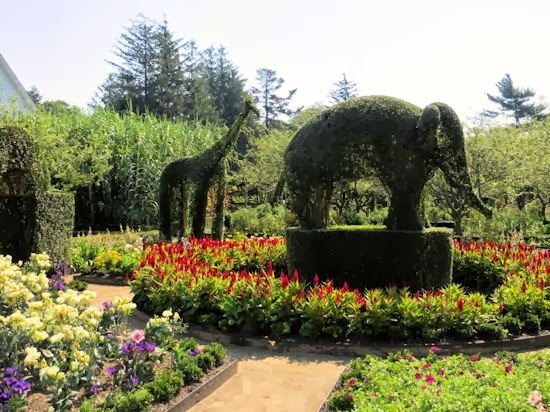 The topiary animals are made of California privet and yew while the geometric figures are from California privet and English boxwood. Here is the mighty lion made of California privet and surrounded by annuals. The beds are planted with annuals that change with each growing season. Gardener Joe Carreiro designed these driveway arches as an entry to the garden. 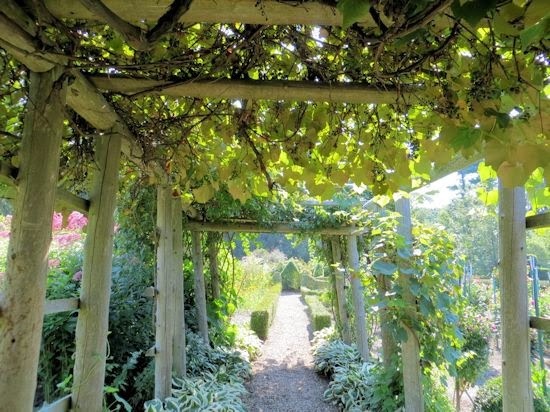 The garden houses two arbors, one draped with Magnolia x soulangeana and on this arbor with Grape (Vitus vinifera). 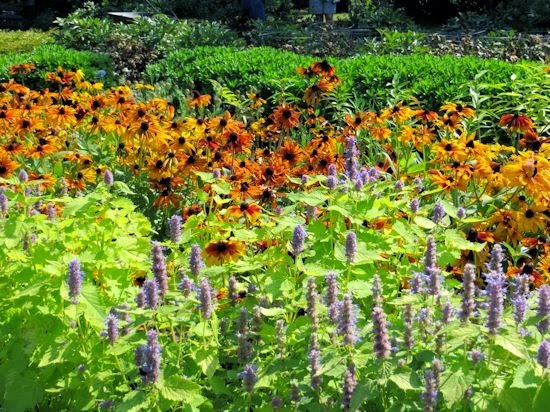 A beautiful perennial border garden shows the colors of late summer. This area was re-designed and replanted in the fall of 2004. Here is the full garden to give you an idea of the size. 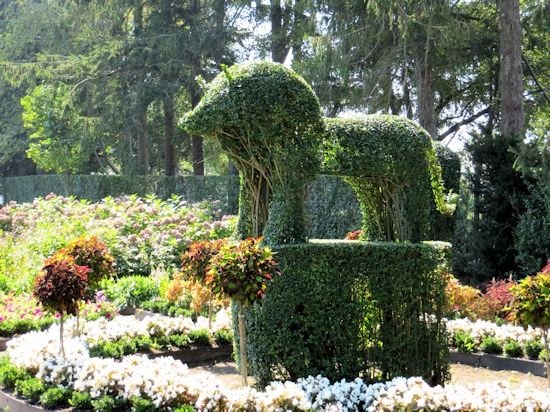 The framework of the garden is made of boxwood and privet hedge. 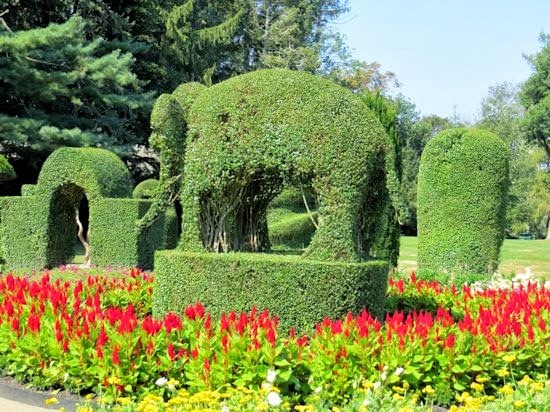 The topiaries were started in 1901 in a nursery then moved to their present location in 1912. Every year Green Animals hosts several events and is visited daily by tourists. 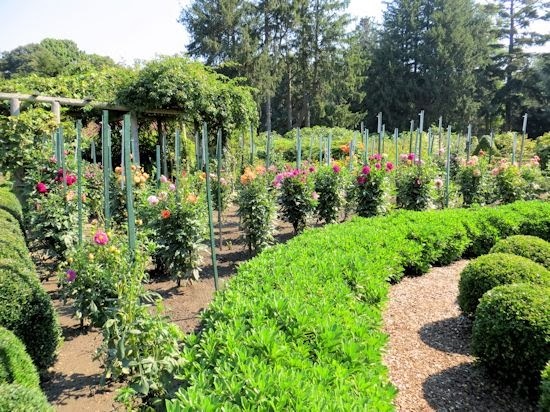 I truly enjoyed visiting these wonderful gardens along with the mansions of Rhode Island. I hope you enjoyed the virtual tour as well.